This is my last show of 2012, but fear not, Hubie Sounds will be back in the new year! Hubie Sounds is back on the NSB Radiowaves this Tuesday night with the last Bass[sic] Special of the year! This time celebrating Bass[sic]‘s 1st Birthday party on the 24th of November in Shoreditch, London, I will be spinning some bass music monsters, as well as an exclusive DJ set by Pimpsoul, recorded live at the last Bass[sic] in September. As well as all that, I will also be compiling a list of my favourite tunes of the year in a top-of-the-pops-countdown stylee, so this show will be quite simply unmissable! The Hubie Sounds Bass[sic] Special – Tuesday 13th November @ 9pm GMT – live and direct on NSB Radio! As I’m sure most of you are aware, this ‘summer’ is quite a significant one for the people of this ‘sunny’ isle (I sigh as I look out the window at what can only be described as a typical British summer’s day – biblical rainfall, people cowering under their umbrellas and so on). Anyway, with the Queeny’s celebrations last week, the English footy team toiling at the Euros and, of course, the impending ‘lympic shenanigans here in London (redacted so the IOC don’t sue me), the people of this country are in a celebratory mood (despite the weather). So this Tuesday I will be presenting a special Hubie Sounds focusing on the best of British bass music over the years. You can expect loads of classic tunes, old and new, from British artists including Orbital, New Order, Underworld, Plump DJs and many more! Hubie Sounds celebrates British bass music – Tuesday 12th June @ 9pm BST – live and direct on NSB Radio! I trust you’ve been having a pleasant Zombie Jebus weekend. This Tuesday Hubie Sounds returns to the NSB Radio airwaves with another cracking show chock full of win. This week I’ll be broadcasting a live set by Ford Audio (aka Merka), recorded at last week’s banging Bass[sic] event at The Cornershop in Shoreditch. Expect to hear plenty of the-man-formerly-known-as-Merka’s trademark eclectic beats and filthy basslines, as well as some exclusive new material from the man himself. But wait, there’s more! I’ll also be hitting the decks and spinning my usual selection of funk, hip hop, breaks and house for your lovely ears. Make sure you tune into Hubie Sounds – Tuesday 10th April @ 9pm UK time – live and direct on NSB Radio! * 8pm – 2am – FREE ENTRY ALL NIGHT! I hope you can join us back in the rave cave, downstairs at The Cornershop where we belong! Once again, entry to this party is FREE all night long and, considering the heavy lineup, we’re expecting the venue to be rammed so make sure you get down there nice and early to avoid disappointment! Later this week the bass-tastic Bass[sic] party returns to the Cornershop in Shoreditch, so this Tuesday night I will be celebrating with another Bass[sic] Special! As part of this special I will be playing the second installment of Bass[sic] residents rejectbeats excellent ‘Everybody’s Dead Dave’ mix set, which is chock full of bass music win. More info about this week’s Bass[sic] event later in the week. Watch this space! Hubie Sounds is back on the interweb airwaves this Tuesday night. This time around Hubie will be presenting two solid hours of bass-heavy classics old and new – if it’s got a big bassline in it, Hubie will spin it! So expect to hear booty-bouncing classics from all sorts of genres:- dub, hip hop, breaks, house, jungle, tv theme tunes, the list goes on! 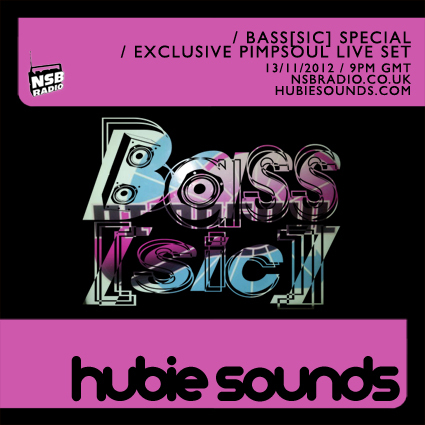 The Hubie Sounds Bass Music Special – Tuesday 22nd November @ 9pm UK time – live and direct on NSB Radio! Thanks for tuning in last night, I hope you enjoyed the show. Big ups to my good pal Big Nick D for another excellent guest mix too. * Tracklist unavailable at the moment – keep an eye on this website for updates! See you at The Cornershop, Shoreditch, this Saturday 12th November for the Launch of Bass[sic] with Peo de Pitte and The101Connection! 8pm-2am – FREE entry! Make sure you check out the Facebook event page! As I’m sure a lot of you now know, myself and my good friends at rejectbeats and Big Square Records are launching our new club night, Bass[sic], with Peo de Pitte and The101Connection this Saturday night. And to help promote it, I am dedicating this Tuesday’s Hubie Sounds show to Bass[sic]. I will be spinning plenty of bass music tuna as well as presenting a special guest mix by our number one resident DJ Big Nick D! So if you like your bass music, filthy beats and no-holds-barred musical attitude, we’re sure you’re gonna love this show! The Hubie Sounds Bass[sic] Special – Tuesday 8th November @ 9pm UK time – live and direct on NSB Radio!